Year of Establishment -The company was established in the year 1992 by Mr. Kalyan Brata Ghoshal and is registered. This is a Pvt. Ltd Company. 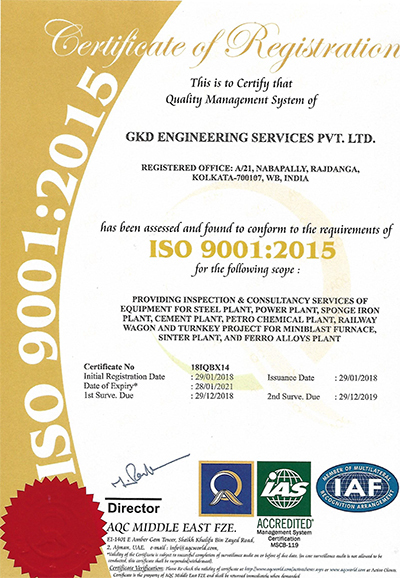 We are an ISO 9001:2015 Company, engaged in the equipment inspection for Steel Plants, Power, Cement, Sponge Iron, Petrochemical plants and inspection of Railway wagons and its various components for the last 22 years. Our expertise the field of inspection is well recognized by many companies of repute in INDIA and abroad. We have inspected a number of sophisticated equipment like Ladle cranes, Slab Handling Cranes , Goliath Cranes, Equipments for Bar and Rod Mills, Hot Strip Mills, Cold Rolling Mills, Pressure Vessels, Hear exchanges, Gear Boxes and many sophisticated equipments. Based in Kolkata (West Bengal, India), GKD Engineering Services Pvt. Ltd have developed a high-tech infrastructure which is spread over a large area. The infrastructure is well-equipped with all the modern machinery, tools and equipment to boost up the production rate. All the machinery is handled by our team of experts which is selected after strict examination of skill and expertise. These professionals are well-versed with the modern technology and work in the direction to boost up the production in the manufacturing process. We have also employed a team of quality controllers who test the entire range on various parameters to ensure their flawlessness. All our professionals keep a sharp eye on the entire manufacturing process so as to deliver a qualitative output. Additionally, we provide third party inspection services of equipment for steel, power, sponge iron, cement and petrochemical plants. All the products and services offered by us can be customized as per the requirements of the customers. Besides, we follow ethical trade practices, transparent business dealings and flexible transaction modes which have helped us in garnering a wide client base. Owing to the wide clientele, we have been able to establish a number of branch offices in some of the major cities like Mumbai, Delhi, Chennai, Bangalore, Pune, Rourkela, Jamshedpur along with the corporate office in Calcutta. We have also established ourselves internationally at Toronto, Ontario and Canada. Under the able guidance of our mentor, 'Mr. Kalyan Brata Ghoshal', we have been able to win the trust and confidence of a large number of patrons across the world. His managerial skills, vast industry knowledge, fascinating business decisions and constant motivating persona have helped us in setting a mark on the industry. "To inspect the equipment as per drawing, specification and standard. We have access to national and international standards. We also train and guide the vendors from the stages so that the quality jobs are produced." We are backed by a team of sincere and hardworking professionals who leave no stone unturned for providing the customers with an excellent range of products and services. All these professionals are selected after the strict examination of their skill & expertise and strive hard to boost up the production rate in the best possible manner. Our professionals frequently communicate with the clients to know about their exact requirements and serve them accordingly. We are a prominent ISO 9001:2015 certified business entity engaged in providing our customers with a qualitative range of products for we believe in quality instead for a quantity sale. All our products and services are manufactured and rendered as per the international quality standards using high quality raw material and tools. Besides, our quality inspectors examine the entire range thoroughly on various pre-defined parameters to ensure zero-defect and flawlessness. Additionally, we employ third party inspection for all the products and services offered by us. Mumbai, Delhi, Chennai, Bangalore, Pune, Rourkela, Jamshedpur and Head Office in Calcutta. We also have international office at Toronto, Ontario, Canada. Owing to the vast industry experience, we have been able to serve some of the most reputed clients in the industry. These clients appreciate our inspection services for their flexibility, reliability, personalized approach and timely execution. To set up ferro alloys project, (ferro-mng, silico-manganese, ferro silicon, ferro chrome) including sinter plant. Maximum permissible size of single unit: Submerged arc furnace- 24 MVA- 200T on (Fe-Mn).